One year ago, just as the Fed had started quantitative tightening, i.e., the shrinkage of its balance sheet, JPMorgan's Nikolaos Panigirtzoglou, author of the popular Flows and Liquidity newsletter predicted that the more than $1 trillion decline in G4 central bank bond purchases in 2018 relative to 2017 would be a key driver for the change in the overall supply/demand balance for government bonds, and result in broadly higher yields across the board. And sure enough, with the 10Y rising from 2.33% one year ago to a multi-year high of 3.24% earlier this month, as government bonds around the globe also saw a material pickup in yields, that prediction has been proven accurate. Where JPM was wrong was in its estimates for matched pickup in non-central bank demand for government paper, where as Panigirtzoglou admits, he was overly optimistic (more on that shortly). So with traders - across all asset classes, including equity, credit and rates, all focusing on what happens to US Treasury yields next, the JPMorgan strategist revisits his previous analysis on global bond demand and supply, incorporating updated supply forecasts both for the balance of 2018 as well as for 2019. "Given this year has seen the largest increase in excess supply of bonds since 2010, which as we noted last week has together with continued Fed hikes contributed to a tightening in financial conditions that has been reverberating across markets, there has been considerable interest in how next year is shaping up." Attention on 2019 is especially acute as the Fed’s balance sheet normalization process is set to accelerate given that it is only in 4Q18 that the monthly cap for the quantity of maturing bonds that are allowed to roll off has reached its steady state of $50Bn/month, which unlike 2018 when QT was just starting, will induce a further increase in net supply that needs to be absorbed by the market of more than $100bn. It's not just the Fed: with the ECB set to end its QE purchases in December this year and we see the BoJ continuing its gradual slowdown in bond purchases to ¥30tr in 2019 compared to around ¥40tr this year, JPMorgan notes that this collective shrinkage of the G-4 balance sheet means that the market needs to absorb a further decrease in price-insensitive QE demand of more than $400bn next year. Here's the bad news: adding together both the supply and demand side impact, the G4 central bank flow looks set to decline a further $550bn next year. To answer the key question for interest rates in 2019, here is what JPMorgan sees in terms of potential offsetting sources of demand to this continued change in central bank flow, which has clearly put upward pressure on bond yields in 2018. This is the biggest source of demand disappointment in 2018. According to Panigirtzoglou, he had expected G4 commercial banks to offset some $500bn of the more than $1tr shift in the central bank flow this year. This was based on an estimate that the $7tr of QE purchases by G4 central banks in the prior five years had seen commercial banks accumulate around $3tr less bonds than they would accumulated if QE had not happened. However, the bank's latest estimate of G4 bank bond demand for 2018 suggests they offset only around $200bn of the central bank QE flow shift, "or a multiplier of around 0.2 rather than slightly more than 0.4 we had expected", according to the Flows and Liquidity author. 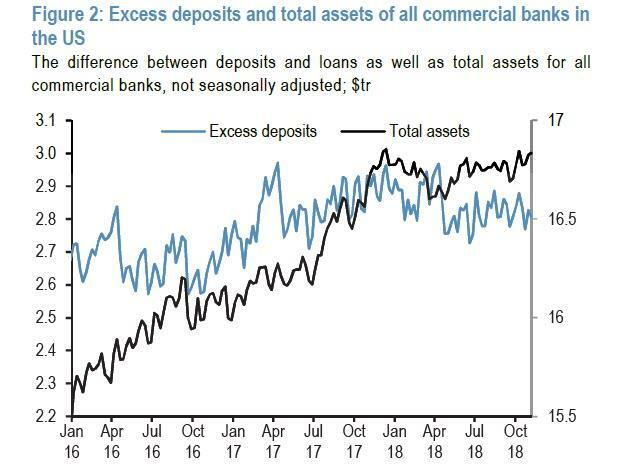 As the primary reason for this weakness in demand relative to his baseline expectations, the JPM strategist notes the fact that US banks have ceased accumulating excess deposits in 2018 (Figure 2), reducing the need to increase holdings of liquid assets. Moreover, US banks’ growth in total assets effectively ground to a halt this year for the first time since 2010. Furthermore, US banks appeared to have more than adequate HQLA to absorb some reduction in reserve holdings before needing to accumulate further liquid assets. That said, with front-end Treasuries having cheapened significantly relative to OIS, this has increased their attractiveness for banks to hold as HQLA for regulatory purposes. Additionally, given the continued decline in the G4 central bank flow, the bank sees G4 commercial banks providing some offset to this decline next year also. However, given the weakness in this offset this year, we adopt the more modest 0.2x multiplier as a conservative estimate, which gives us an improvement in commercial bank demand of around $100bn in 2019. Here too, and similar to its optimistic commercial bank demand forecast, retail bond demand saw the largest deterioration relative to JPM's expectations for this year. 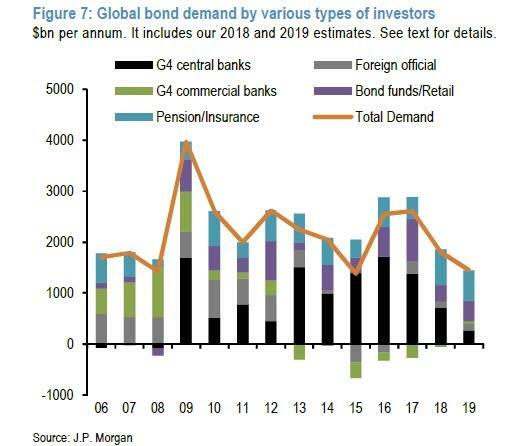 Following on from last year’s more than $800bn of bond demand, JPMorgan had expected a relatively little changed demand backdrop for this year. But following a very strong inflow in January, bond demand after the equity market correction in Jan/Feb has been very modest and is currently tracking a $320bn annualized pace for 2018. This pace was as weak as 2015 and over the past 10 years only 2011 and 2013 have seen weaker bond demand numbers. Similar to 2016, the bank expects some recovery in 2019 demand from this year’s weakness, but pencil in a relatively conservative improvement in bond demand of around $80bn, or around halfway towards the average annual bond demand over the past decade of around $480bn. So with the two traditionally largest sources of bond demand - commercial banks and retail investors - set for further disappointment, that brings us to the third potential "Hail Mary" for bond demand in 2019..
As we discussed in recent weeks, and in keeping with the demand drift for the above two categories, EM reserve growth has weakened in the second half of the year relative to the $230bn annualized pace that IMF data suggested for the first half. 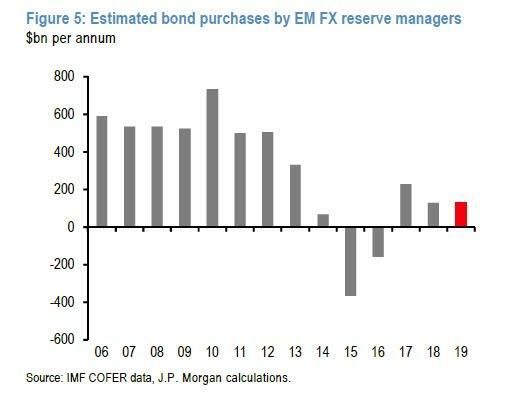 Indeed, JPM's estimate of EM FX reserve growth in the second half up to end-October - perhaps in part due to the recent plunge in oil prices which have a direct impact on reciprocal demand for Treasuries in the petrodollar recycling pathway - is for a modest reduction of around $15bn, which brings down the annualized pace of reserve growth to $130bn in 2018 or around $100bn lower than last year. In addition to the impact of oil prices, this decline in reserves has been driven primarily by China, where the PBoC has likely been intervening to smooth the path of CNY depreciation. 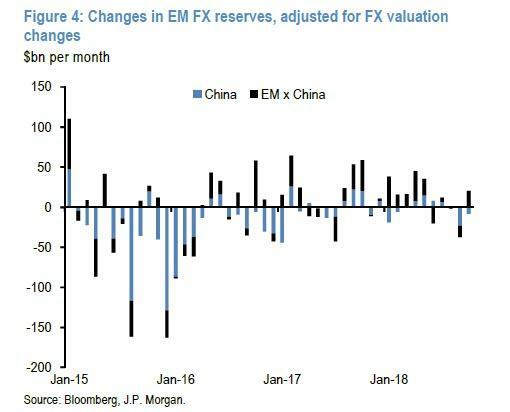 Given US-China trade tensions are likely to persist into next year and most analysts expect depreciation pressures on the currency to continue, JPMorgan sees little prospect for a meaningful pickup in bond demand from reserve accumulation to offset the decline in G4 central bank demand and project 2019 bond demand unchanged at $130bn. With 3 of the 4 top demand categories set to disappoint, one potential wildcard is pension fund demand. First, as JPM notes, it currently only has data for G4 pension fund demand from the various central banks’ flow of funds publications up to 2Q18, which suggests aggregate demand of at a $700bn annualized pace. This is modestly higher than it had expected at the start of the year and reflects in particular strong demand by US pension funds, where the significant improvement in the funded status of private defined benefit pension funds was driven primarily by increases in the interest rates used to discount future liabilities. Indeed, the yield to worst on the Bloomberg US corporate long Aa index rose by just over 80bp during the year up to end-October, and the Milliman data on the 100 largest defined benefit pension plans showed an improvement in the funded status as a result of a decline in the value of liabilities of more than 7% even as asset returns were also modestly negative at -2% as a result of the October correction. The improvement in the funded ratios creates an incentive for these pension funds to increase allocations to bonds to lock in this improvement. 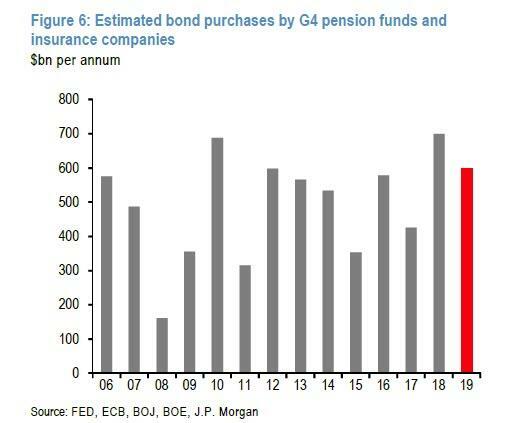 To Panigirtzoglou, this means that demand from pension funds and insurance companies will remain supportive in 2019, although even here the strategist factors in some modest mean reversion from this year’s $700bn annualized pace to around $600bn next year, which is still above the average annual demand over the past 10 years of around $500bn. 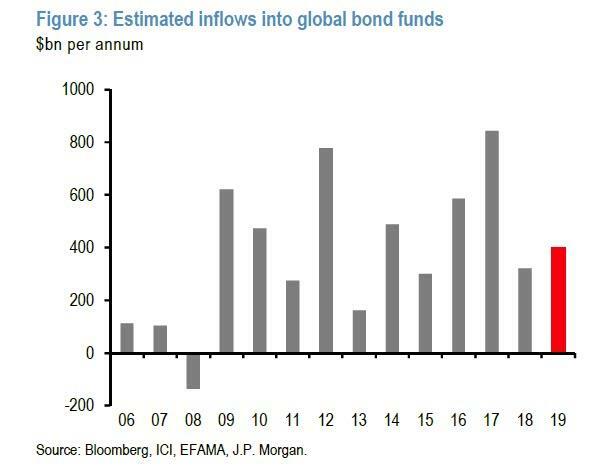 Consolidating these different influences on global bond demand, including the decline in net purchases by the BoJ and ECB as well as the modest offsets from other bond investors outlined above, JPMorgan now expects a further significant reduction in bond demand next year of around $350 billion. In fact, as shown in the chart below, summing across the five main sources of bond demand suggests that in 2019 consolidated bond demand will be the lowest it has been since 2008, just as the Fed was set to launch QE, and send both interest rates and yields down to record lows. 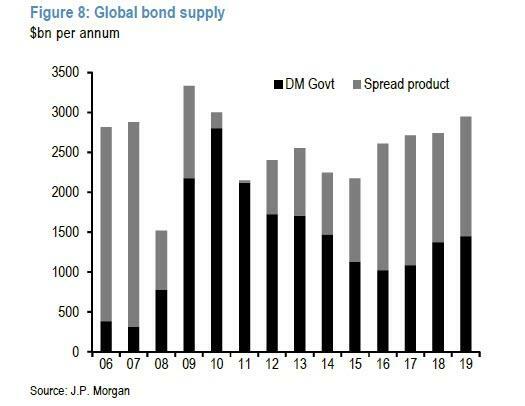 Meanwhile, on the bond supply side, JPMorgan expects a modest aggregate increase in both DM government and spread product issuance. For US Treasuries, the bank sees around $160bn of increase in net issuance, including the effect of an expanded fiscal deficit as well as the increase in Fed balance sheet normalisation, while for other DM government bonds it sees a modest decrease driven mainly by a reduction in Euro area government bond issuance. On aggregate, JPM expects net global bond supply to increase by approximately $130 billion. Putting it all together, the combination of a $350bn deterioration in bond demand and a $130bn increase in bond supply leaves Panigirtzoglou concerned about the net deterioration in the bond supply/demand balance of around $480bn in 2019, compared to around $830bn this year. We note that the 2018 deterioration in the balance between bond demand and supply shown in Figure 9 is much higher compared to our projections from a year ago, as at the time we had overestimated the demand of not only retail investors, which was our biggest forecast error, but also of FX reserve managers and commercial banks. Summing it all up, the largest US bank warns that "the continued deterioration in the bond supply/demand balance we expect for next year looks set to put further upside pressure on yields in 2019." And since it was the gradual at first, then suddenly sharp spike in US yields that catalyzed the stock market slump in October, that has since affected November returns as well, traders will be especially focused on JPMorgan's assessment for 2019's net demand shortfall, because if accurate it would suggest that the only way demand will emerge is if yield reprice materially higher, together with all the adverse side effects for all other risk products.